Clinicians using the Augmedix system spend less time taking notes and more time talking to patients. It's back to the future at some Dignity Health clinics, where physicians are bespectacled in Google Glass frames. But casting aside problems that hindered early adoption of the 6-year-old technology, these physicians are very much in the present—and very present too, since they don't have to divert any attention away from patients and toward note-taking. That's because off-site health assistants are taking notes for them, listening and watching to patient encounters via the high-tech specs. "Our physicians are able to have a much more clinical relationship with their patients, as opposed to sitting at a laptop or dictating into a handheld microphone," said Dr. Scott Robertson, CEO of Pacific Central Coast Health Centers at Dignity Health. "They feel as though their time in the exam room with the patients is spent in a much more productive manner." The point is not just to use once-futuristic technology—it's to use that technology to reduce the burden on physicians, who sometimes struggle to balance the bureaucratic with the clinical. "Physicians have an incredibly high documentation and administration overload. You feel a bit like you're in a sausage factory," said Pelu Tran, co-founder and chief customer officer and president of Augmedix. "The problem Augmedix seeks to solve is that of physician burnout and the dehumanization of the doctor-patient visit." By using Augmedix's remote scribes, a provider can save up to 15 hours per week, according to the company. To do that, the provider dons the Google Glass device, which beams the sights and sounds of the visit to a remote scribe who charts the encounter in the electronic health record. 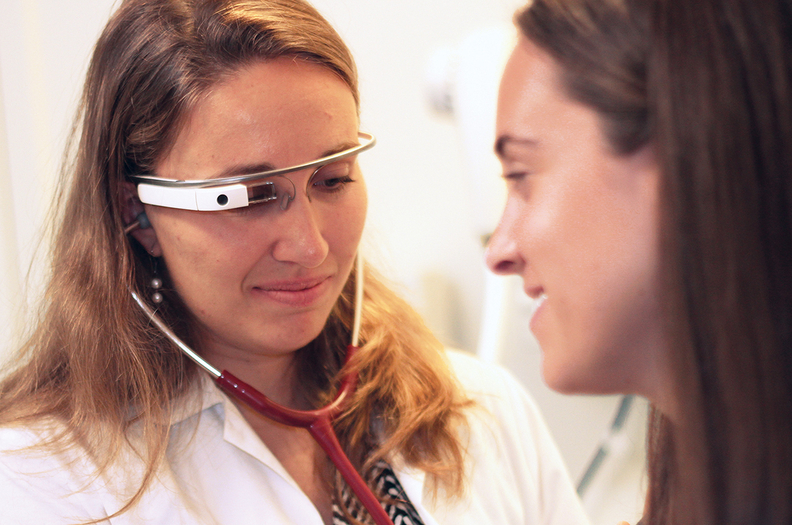 Meanwhile, clinicians can see information about the patient in the tiny Google Glass screen. That means a provider can essentially avoid touching a computer at all during a patient visit. Usually, almost immediately after that visit is over, the provider can access the related notes. Tran considers the health assistants to be more than just scribes. Instead, they're full-blown members of care teams who take notes and help coordinate care. For instance, through a program called Care Assist, which is currently live at Dignity, Augmedix can tell the clinician in real-time whether he or she should cover certain relevant quality measures during a patient visit. "The providers are being pulled away from the bedside, and scribe technology is going to offer them the opportunity to be at the patient's bedside more often," said Kay Bain, a manager in Huron's healthcare technology business. Indeed, Dignity Health physicians using the service can slash about an hour and a half to two hours from the time they spend daily on documentation. Dozens of Dignity Health physicians use Augmedix in the system's clinics, where nearly all patients agree to let clinicians use the service. For the most part, clinicians have been happy with it, but about 1 in 5 physicians don't like it as much, Robertson said, often because they don't want to change their workflow. Physicians also struggle with connectivity issues. "Any time you inject new technology into the clinical space, you can always have potential downtime because of the bandwidth and the hardware capabilities of your infrastructure," Robertson said. But, he added, luckily the clinicians are still well trained on the EHR, so they're comfortable reverting to that system. It's important that physicians and patients trust that their data remain correct and secure throughout the note-taking process, Bain said. Augmedix protects the data with end-to-end encryption and tests its security measures. Next, Augmedix will work on automating more of the note-taking. "We're fundamentally a supply-limited service," Tran said. "We can only bring on so many assistants." So the company is tapping speech recognition technology to computer-generate certain parts of the notes, making the assistants more efficient. The assistants, in turn, will proofread and edit those notes.